The "Daily Show" host's searing and personal take on the Philando Castile video and verdict marked an extraordinary moment for late night comedy. Trevor Noah tacked the Philando Castile shooting on "The Daily Show." The origins of "Daily Show" host Trevor Noah's humor can be found in "Born a Crime," his compelling memoir about growing up in South Africa as the son of a largely absent white father and a fearless black mother who raised him. The book makes clear that Noah’s mining of social, cultural and political absurdity for laughs isn't a defense mechanism. It's a deceivingly potent weapon aimed at disarming those with power derived from irrational, institutionalized hate and stupidity. But Noah ditched the humor Wednesday night as he showed the disturbing dashcam video of Minnesota cop Jeronimo Yanez fatally shooting motorist Philando Castile during a 2016 traffic stop gone horribly wrong. The footage, released after Yanez’ acquittal last week on manslaughter charges, "broke me," Noah said. Noah's far from the first late night comedy host to turn solemn in an era when tragedy all too often brings satire to a pause, however brief. But his searing, personal take on the verdict and the video marked an extraordinary moment for his career and for comedy. It also underscored the role he’s assumed in an otherwise all-white late night TV landscape. Noah's bold decision to broadcast the footage came a day after a “Daily Show” Internet-only monologue in which he revealed he's been stopped by police eight to 10 times since moving to the U.S. six years ago. "I don’t know what silent crime you think I’m on my way to commit, but I’ve been stopped in a Tesla," Noah said, going for the laugh, one of several he earned during the segment. 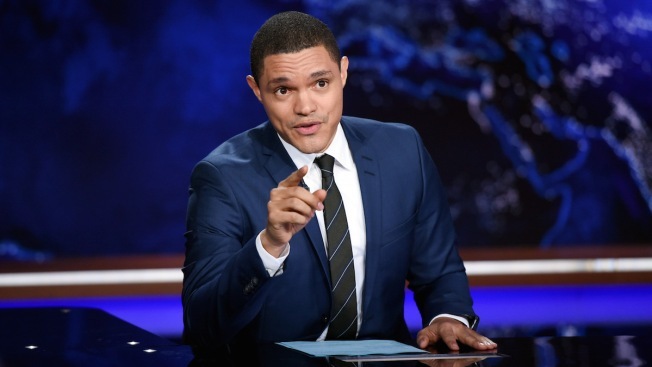 When Noah took over the "Daily Show" in September 2015, he initially came off as an amiable, if somewhat detached observer – especially when compared to his vaunted predecessor, Jon Stewart, whose exasperation at the state of the world grew with time. But Noah, beginning with the presidential election season, delivered increasingly pointed barbs, tapping his feet-in-multiple-worlds perspective to occasionally liken Donald Trump to an African dictator. This week, the man whose birth was a crime under South African apartheid conveyed the perspective of being a black person in the United States. A shooting that seemingly defies logic and human decency spurred Trevor Noah, who built a career on smart mockery of the illogical and inhumane, to get deadly serious.